A poem "Shukri Baddour mourning alSharour"
Poem by Shukri Baddour Mourning blackbird of the valley (shahrour alwadi) Asaad Khalil Samaan, from Goldsboro, NC. A poem "alTebshrani mourning Shukri Baddour"
Poem by Sulaiman Tebshrani mourning Shukri Baddour, from Columbia, NC. A poem "admiration and loyalty to lifelong friend Shurki Baddour"
A poem "Mourning of Sharour alWadi"
A poem by Shukri Baddour mourning the blackbird of the valley (sharour alwadi) Asaad Khalil Samaan. In alResala Magazine, vol. 11, no. 191 & 192, p.24. A poem "feel for the affected/distressed". A poem by Shukri Baddour to encourage people (the public) to donate and help those affected in Palestine, Syria & Lebanon. Explaining the history and unity of these countries. In alResala Magazine, vol. 11, no. 191 & 192, p.23. A poem "to the memory of my friend Shukri baddour"
A poem by Shukri Baddour as a reply to Naseeb Salibi earlier friendship poem. 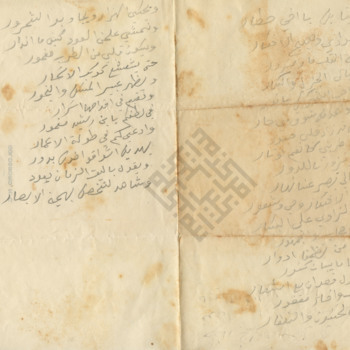 Baddour's poem dated April 11, 1936. A poem by Sulaiman Samaan alTebshrani to Shurki Baddour on the occasion of electing him as the President of the Lebanese Syrian American Association in North Carolina in the alResala Magazine, vol 10, no. 159.